If you think "camping" means "uncomfortable," we have some surprises for you. Just because you're exploring the backcountry doesn't mean you have to go off the grid. Innovative developments in gear have brought camping into the 21st century. "I'm a fan of pop-up tents that fold into flat circles and spring into complete tents," says Gast. Another of his favorite toys: a generator that lets you power any USB-chargeable device-no outlet required. Rent a cabin! KOA's cozy log cabins feature beds and bunks, as well as electricity (and some even come with air-conditioning! ), starting around $60 per night. Add in the fire pit or BBQ just outside your cabin door, and hey, you can have your s'more and eat it, too. What's a vacation without delicious food? Camping doesn't have to mean hot dogs and beans. From grilled gourmet pizza to caramel corn, KOA's library of recipes will make you excited for the camp dinner bell. Another great way to see America while enjoying the comforts of home is to travel by RV-and you can enjoy KOA's full-service RV sites for roughly the same price as a cabin. Many of these sites offer special amenities, like gas barbecues and hard-surface patios with furniture-giving your traveling house an instant backyard. 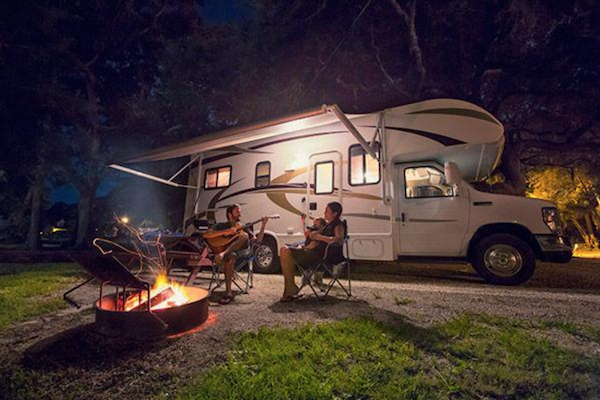 Of course, RVs can be costly to fill up, so here are a couple of resources: Maintenance and driving tips from KOA RV expert Mark Polk can help you conserve fuel, and GEICO's Gas Finder can assist with finding the cheapest real-time rates. Feeling the wind as you travel by motorcycle is as close to flying as you can get, without leaving the ground, of course. The minimal storage space can be a downside, though, which makes the convenience of KOA's cabins that much more appealing. And since many KOA sites encourage motorcyclists to keep bikes near their cabins, getting back on the road is a breeze. Check out KOA's tips on how to pack and prep for a motorcycle camping experience. Keep all your trip resources close at hand by downloading GEICO's convenient mobile app. With features that provide access to real-time Emergency Road Service, Digital ID Cards for proof-of-insurance and Gas Buddy for the best gas prices, you'll have a worry-free trip.